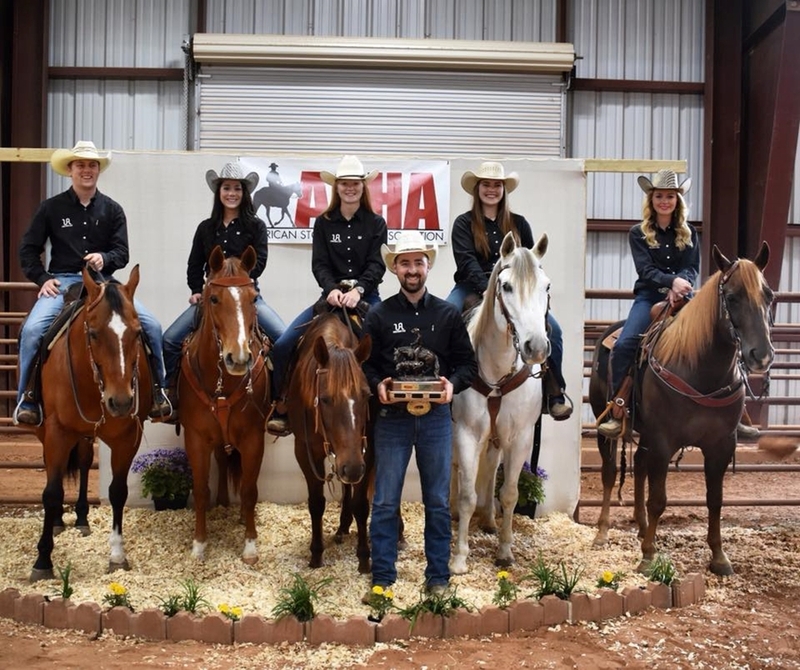 The U of A Ranch Horse Team defended its title as the American Stock Horse Association Division II National Champions on April 22 in Sweetwater, Texas. The competition was remarkably high this year and the battle for the championship came down to the final event. "This year was exciting because we won the Division II National Championship last year and were really hoping to repeat it," said Daniel Potter, coach of the U of A Ranch Horse Team. "We didn't know if we could take first again because as Division II has grown, the competition has gotten harder and harder." The U of A Ranch Horse Team was met with stiff competition. Missouri State University, who trailed closely behind the U of A, had competed and placed in Division I in previous years. "They're a pretty high caliber team to compete against, and I showed there when I was young, so it was pretty cool to just barely beat them," said Potter. In addition to the national win, the team obtained seven individual Top 10 class finishes, including a Reserve Championship in Novice Working Cow-horse by sophomore Kaley Collins. "The individuals competed against Division I and Division II riders all together, so for her to have the high score out of everybody was really exciting for us," said Potter. "Kaley's confidence has really grown and she's become one of our strongest competitors." To prepare for competition season, the team practiced together between two and four times per week for several months at the Pauline Whitaker Animal Science Center. "I was really happy with how hard everyone was working with the competition being at the end of the school year," said Potter. "Finals were stressing them out and everyone was tired, but they really made it a good year." Potter is looking forward to another great year in 2019. With two national wins and new stables for the Ranch Horse Team under his belt, Potter has been able to recruit three new very promising team members, one of whom currently holds the title of the National Cutting Horse Association's Amateur of the Year. With incoming experienced riders, the team is aiming to compete against the nation's best in Division I in 2019. "It's pretty humbling to see it all come together," said Potter. "The UA Ranch Horse Team didn't even exist two and a half years ago, but we've been fortunate enough to get some good riders and some good horses, and it got kicked off pretty quick. Usually these things take five to ten years to build." Along with their numerous other awards, the team had the privilege of bringing home the inaugural Don Henneke Memorial Championship Trophy and successfully representing the state of Arkansas and Department of Animal Science in national competition.